Had a great time with my friend, Christy Case Keirn, who came for lunch today. Tablescape and more details to come later. I had planned on making lemonade cookies with lemonade frosting, but I got really busy and didn’t get around to it. My backup plan was to make lemon sugar cookies, but they had to be chilled for an hour. Oh, did I mention that I remembered that I wanted to make these cookies at 10 a.m. and I was expecting Christy at noon? Oh, and I needed the oven from 11:00 to noon for the entree? So, that left me with one hour to get the cookies done. Well, never fear. I had the perfect recipe, which I have posted before, however I have made a few changes. 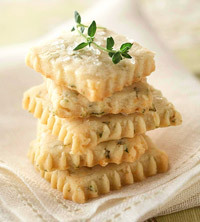 The cookie of the day was Lemon Thyme Cookies! The cookies look amazing. I love to have these with a cup of tea. Thanks for sharing! I absolutely love anything lemon flavored. These look so light that I’m sure they have no calories whatsoever. What a great idea to use the pizza cutter! The photo is gorgeous, and the cookies look delicious. I’m looking forward to your tablescape and the chicken recipe. Oh those cookies look so good! Beautiful image. Oh what a delight. These look lovely and your blog posts are always so very special! Your cookies look really pretty! They sound good too. Thank you for sharing this recipe! These cookies were fantastic! I have to admit I only got one of the three I brought back to the office to have with coffee later in the day. My co-workers had to have the other two! Everyone raved. They are very pretty too! Can’t wait to make them myself. Now, I’m off to find the recipe for the chicken dish! It was wonderful too! Thanks for a great lunch! What a rare treat to enjoy lunch with a friend on china with real linen napkins and fresh flowers on the table. You made my day!